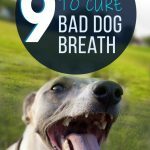 ​So you love dog kisses but don't particularly enjoy being kissed by stinky breath? I get it, sometimes your dog's breath can be outright awful. Thankfully, there's a few natural (and healthy) ingredients that will seriously cut down on that foul odor, and what better way to deliver those ingredients than with some delicious treats? ​A slight distasteful odor is common for doggie breath, but serious gut-wrenching smells typically indicates something is very wrong. Often times this is due to ﻿tooth or gum infections﻿, and a dental check from your vet is required ASAP. Furthermore, persistent bad breath can indicate problems with their respiratory system, gastrointestinal tract, infections, or organs. Please see a Vet first to rule out any serious medical issues. ​What Causes Bad Breath AKA Halitosis? Typically a dog's diet isn't at the top of the menu for most humans, so we don't particularly like the smell of dog kibble being digested. Stinky dog breath primarily stems from bacteria caught in the mouth, teeth, and gum lines that leads to gingivitis, this is called Periodontal Disease. In fact, studies show 80 percent of dogs with bad breath is being caused by periodontal disease. A little dental hygiene and cleaning can prevent and treat the early stages of oral bacteria development, but more advanced cases need to be properly treated by a vet. ​How Do We Remedy Bad Breath? ​For treating your typical case of gross-breath, we look for 2 natural ingredients: Mint and Parsley, which will help cover up nasty odors (similar to how we humans might freshen our breathe). 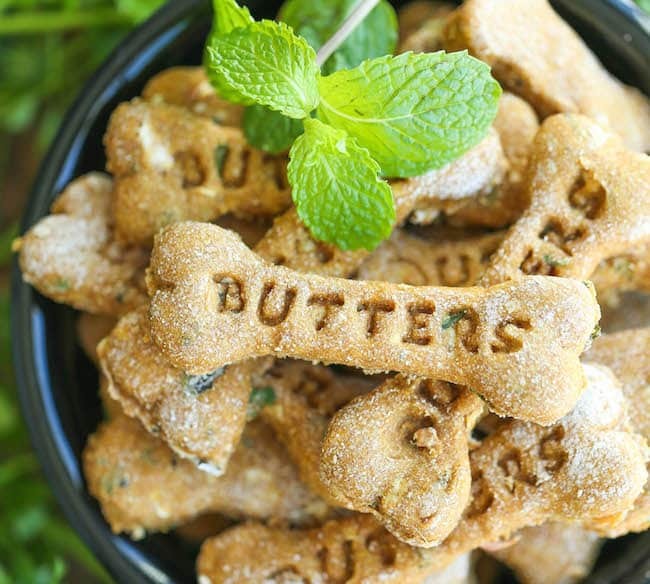 And we have 9 fantastic dog treat recipes with mint and parsley for you to try out. Aside from mint treats, try experimenting with high quality dog foods, b﻿﻿rushing your dog's tee﻿th, keeping them away from toilets and your cat's litter box, and giving them bones to clean teeth naturally. My biggest issue with store bought dental treats is they're full of other not-so-healthy byproducts. 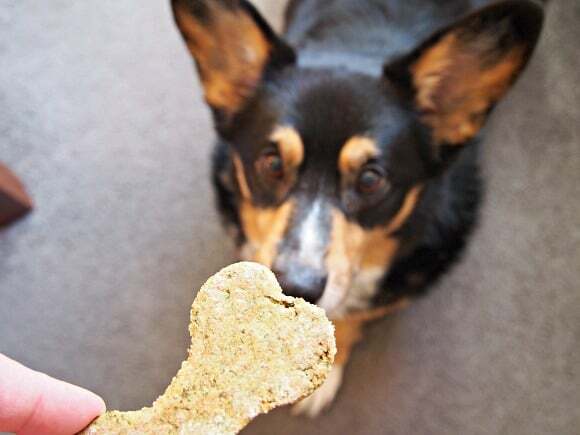 So Hayley from Health Starts in the Kitchen created her own version of breath freshening treats using only healthy ingredients, and is tasty enough for even the pickiest eater (just ask Bella the Yorkie). If your puppy needs a dinner mint then look no further. 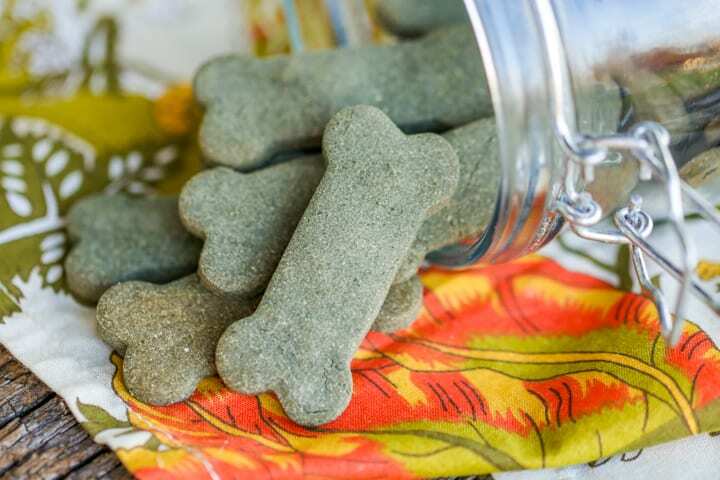 These are simple oven baked miniature treats filled with mint to help your dog freshen up a little. Keep in mind that you can adjust the level of mint to accommodate your dogs taste - as some like it better than others. Peanut butter is probably on every dog's top 10 favorite things in the world. And while peanut butter breath isn't always appreciated, adding a little mint certainly does the trick. These are easy to make and bake in 20 minutes! Who says we can't spoil our dogs while freshening their breath at the same time? Using some apple, pumpkin, and a touch of mint - Chungah from damndelicious created a masterpiece that I think your fur baby will appreciate. And maybe a few certain humans can enjoy them as well? I'm not judging. If your looking for something super easy then look no further. Only 3 ingredients, no baking required, and 5 minutes of your time is all it will take to make these delightful treats. Simply chop up some fresh mint, parsley, and add to plain yogurt, place in a ice cube tray and you're in business! Oat cookies with bananas, carrots, and parsley - now we're talkin! Not to mention it's packed with healthy ingredients and super easy to make (which includes a recipe video) and makes 12 cookies. That should keep away the bad breath for quite some time. This is Ojo, he's a Welsh Pembroke Corgi. Ojo has bad breathe. Thankfully Felicia baked up some amazing little bone-shaped treats in order to save a bit of money, and to save her from the wrath of Ojo's breath. Using just a few simple ingredients your dog can be just like Ojo. We've talked about all sorts of different breath freshening treats here, but this one comes with a twist: buckwheat. After some trial and error, Sarah, has created the perfect buckwheat treat that's not too dry and still minty fresh. While this particular recipe is similar to some others, what I like abut this one is the use of apple sauce to keep treats moist and delicious. And what dog doesn't love a little apple flavor? Furthermore, the use of rice flour would make this an easily digestible treat, for those puppies with sensitive stomachs. Still in the mood for some homemade treats? Is your dog suffering from allergies or sensitivities to certain ingredients? Check out some our best hypoallergenic ​treat recipes, ​or even some of our homemade grain-free recipes. Dog’s bad breath can be nasty. It can be worse if he licks you. Bad breath is not just a simple issue but a big problem as it can grow in much serious oral illness. If your dog has a stinky breath, make sure to consult the vet and get the proper treatment. You can consider adding dog dental treat as a part of medication as well. My vet says my dog’s teeth and gums are healthy but at times his breath is absolutely rank, especially when he wakes up. He eats dirt from the garden, and rabbit poop and any dead bug he has rolled in that didn’t stick to his face. He copied his mother as a young pup and ate faeces! I think its natural and a good idea for dogs to eat these revolting and rotten things because I believe that’s how they keep their gut flora healthy. That’s my theory. Humans wreck their gut flora by ingesting a lot of the wrong things. I’m gonna cook up some of these breath fresheners and see if I can tempt little Beltie, ma B-Boy!